Dele Alli is quite a unique player. Difficult to define him or find similar players. We try to understand him better by looking at his performance stats, comparing them to the ones of the top attacking midfielders in the English Premier League. Further, we try to forecast how his KPIs could evolve in the next three years. 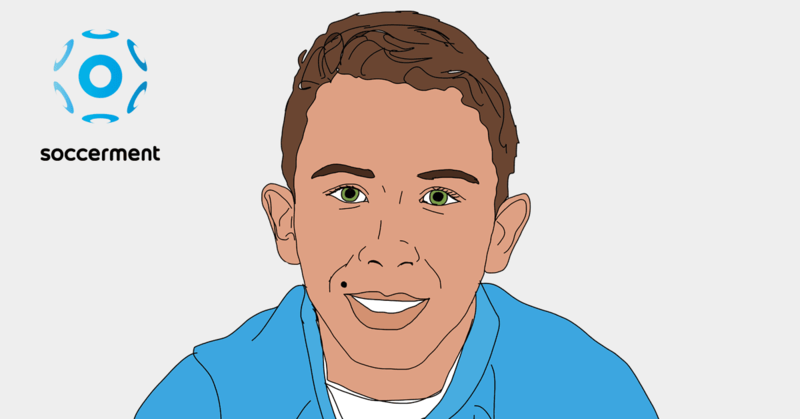 Bamidele Jermaine Alli was born 22 years ago in Milton Keynes, Buckinghamshire, 72 km north-west of London. He joined Milton Keynes Dons aged 11 and moved to Tottenham Hotspurs in 2015. 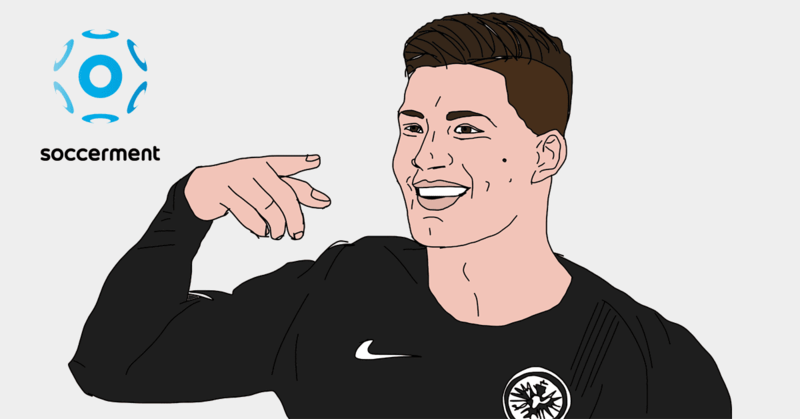 In his senior career so far, he has played a total of 252 matches, scoring 70 goals, quite a high amount for an attacking midfielder of his age. Considering EPL alone, the stats are still impressive: 102 apps, with 36 goals and 26 assists. He was voted PFA’s Young Player of the Year in 2015/16 and 2016/17. Only Ryan Giggs, Robbie Fowler and Wayne Rooney have won the award more than once, apart from Dele. Classifying Dele Alli is not an easy exercise. First of all, his skills are not typical for someone of his height (188 cm). 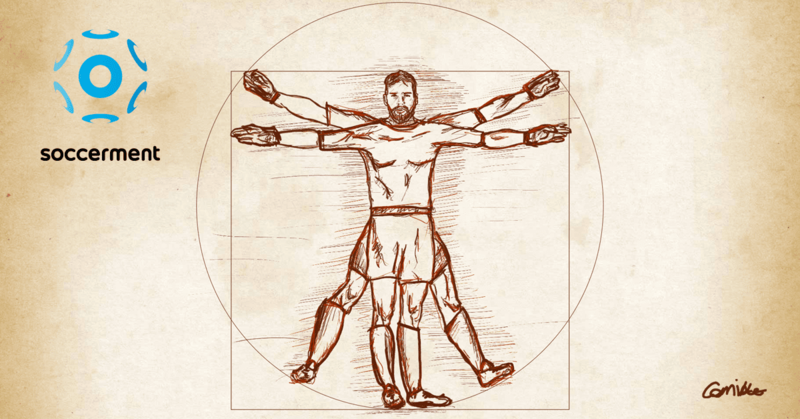 Secondly, his position on the pitch is quite flexible. In Tottenham’s 4-2-3-1, he is supposed to play in the centre between Son and Eriksen (or Lamela and/or Lucas Moura). 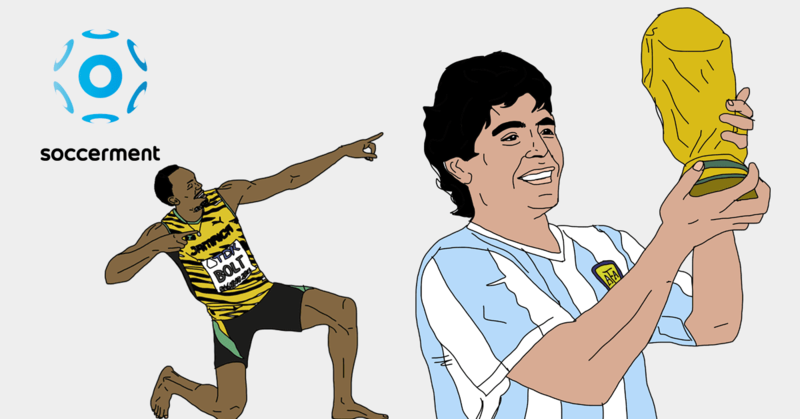 In reality, during the match you often see him on the left wing, where he finds the available space between the lines and from where he can exploit his right foot, for shots or throughballs. But he often exchanges position with Eriksen too, in this case dropping onto the right wing. 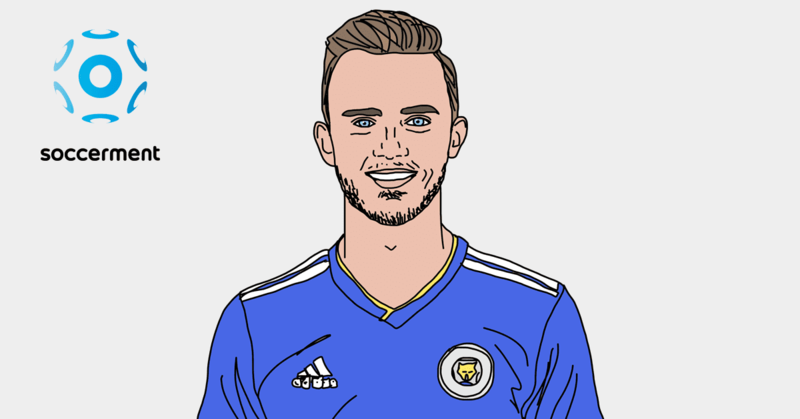 Thirdly, many of his stats are closer to the ones of the average forward, rather than of the average midfielder. According to his coach Mauricio Pochettino: “In the box, he looks like a striker, and outside the box, he plays like a midfielder”. Frank Lampard praised Alli’s intelligence in his ability “to get into the box without being marked”. Could we maybe say Dele Alli is an 8 and a half? 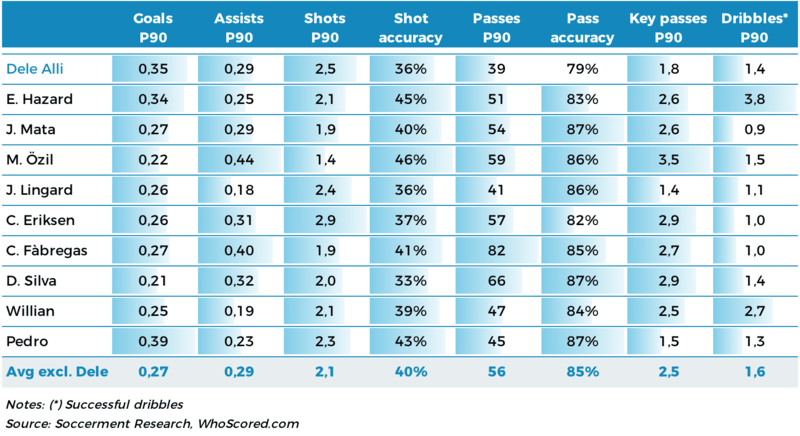 In the table below, we compare some of Dele Alli’s performance stats (average numbers reported in his three-year career at Tottenham) with the stats of some top attacking midfielders in the English Premier League. First of all, it is important to state that all the “comparables” in the sample are more mature and established players. We will see in the next paragraph how their performances have evolved over the years and how Dele’s performances could develop in the future. Confirming the “8 an a half” view, the dataset shows that Dele participates less to his team’s build-up vs to the other attacking midfielders: he performs less than 40 passes per 90 minutes, 30% less than the sample average of 56. The pass accuracy is also lower-than-average, at 79% vs 85%. We believe that both these stats derive from Dele’s position on the pitch, closer to the opponent’s third vs his peers. 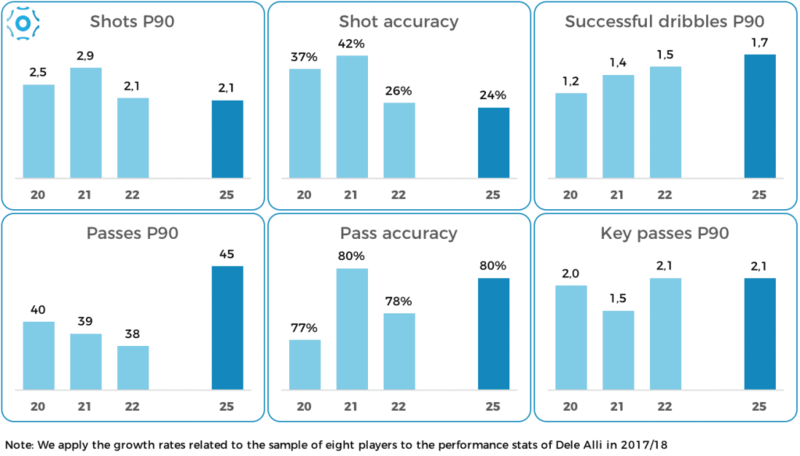 For Dele, the number of key passes (1.8 per 90 minutes) is lower than the number of shots (2.5 P90), while the opposite happens to the average attacking midfielder in our sample (2.5 key passes vs 2.1 shots). This confirms Dele’s higher interest in finalising vs assisting his teammates. The slightly lower amount of dribbles per match is a function of both his physical characteristics and his age (see the next paragraph). The number of goals and assists are not perfectly aligned with his shot accuracy and number of key passes. Let’s start from goals. The average number of goals per 90 minutes stands at 0.35, which is 29% above the average. However, the number of shots is 20% above average (2.5 vs 2.1) and the shot accuracy is 4% lower vs the sample (36% vs 40%). 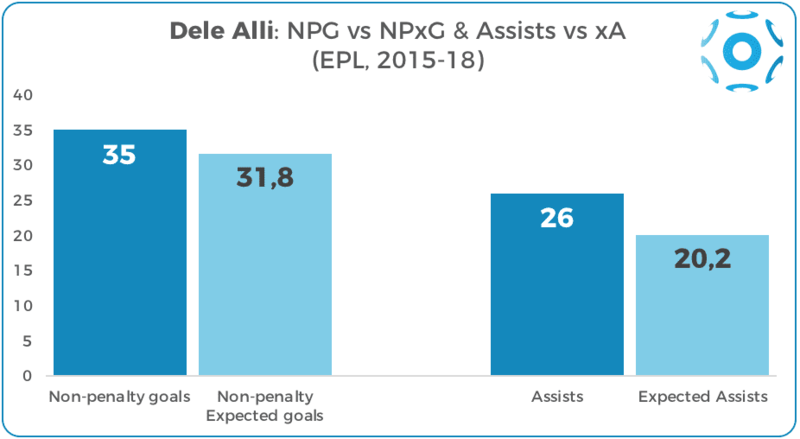 This seems due to Dele having overachieved vs ‘Expected Goals’ in 2015/16 and 2016/17: over the two EPL seasons, non-penalty goals were 27 vs NPxG of 22.3. In the current season the overachievement has been partly offset, with 8 non-penalty goals vs 9.5 NPxG. More or less the same thing applies to assists, with 26 assists in three seasons of EPL, which compares to 20.2 of “Expected Assists”. 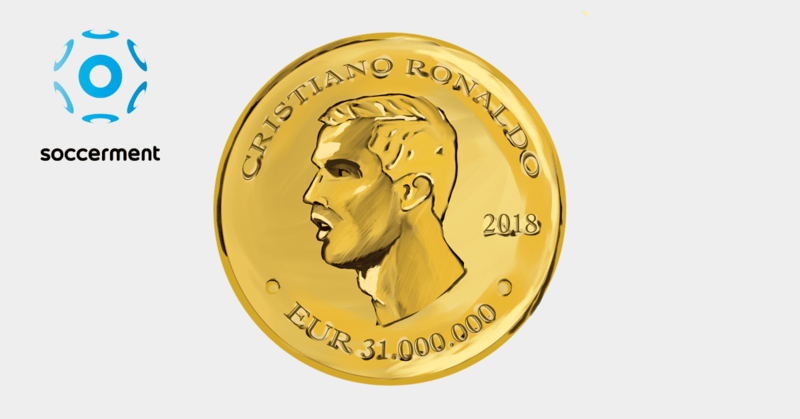 In this case, the explanation should simply relate to Harry Kane‘s ability to transform almost everything he touches into gold. We tried to understand how Dele could evolve in the next few years. 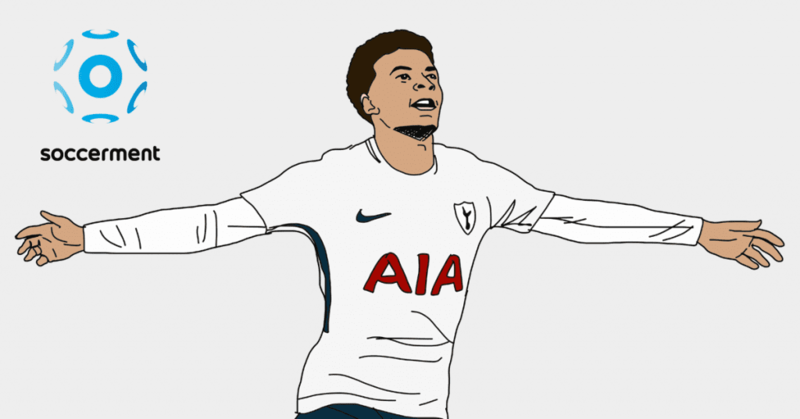 In order to do that, we looked at how the performance stats of the other EPL attacking midfielders have evolved from the age of 22 (Dele’s current age) to the age of 25. In the sample we have the following players: E. Hazard, J. Mata, M. Özil, J. Lingard, C. Eriksen, C. Fàbregas, Willian and Pedro. In the following charts, we show their average performance evolution. 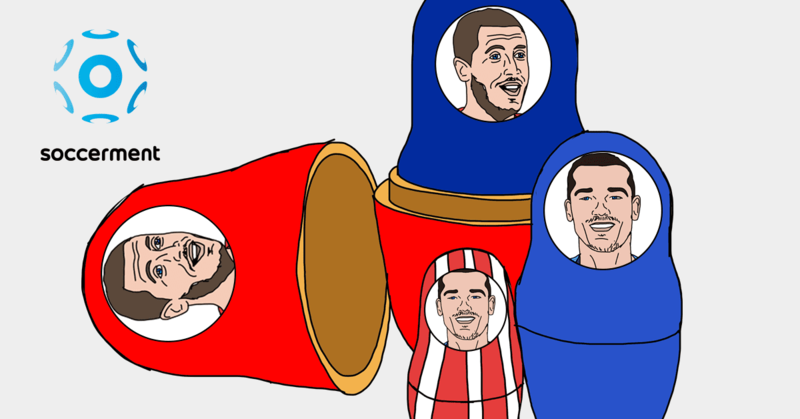 Over the years, certain KPIs, such as the number of shots, shot accuracy and the number of key passes, tend to be quite volatile, but remaining around a certain level. On the contrary, the number of total passes, pass accuracy and (to a lesser extent) the number of successful dribbles tend to grow with time. 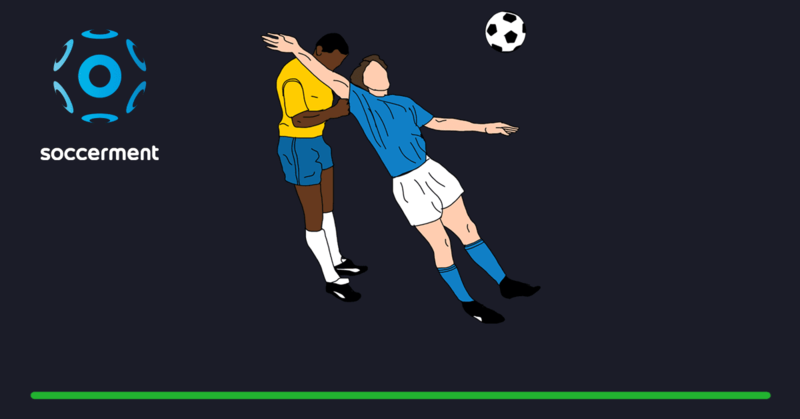 In this very theoretical exercise, we take the average growth rates reported by the attacking midfielders in our sample and we apply them onto Dele Alli’s 2017/18 performance stats. 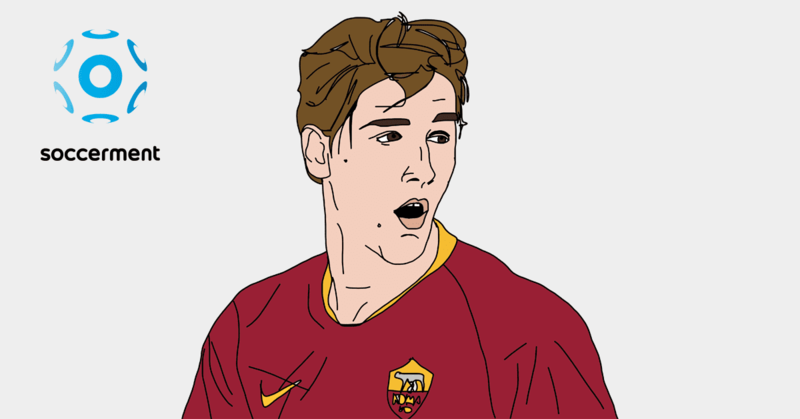 We show the result of our exercise in the chart below: the picture is the one of an attacking midfielder who influences his team’s build-up more than his youth (45 passes per 90 minutes, 80% accuracy), at the cost of (maybe) scoring less. 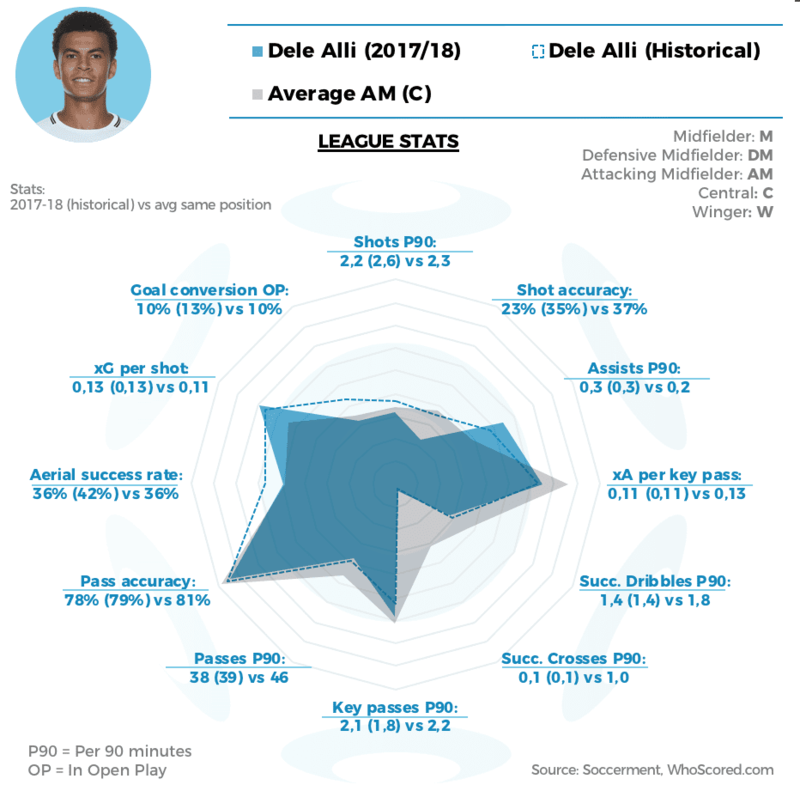 Will Dele become more of an 8 and less of a 9, with time? Let us know your thoughts. 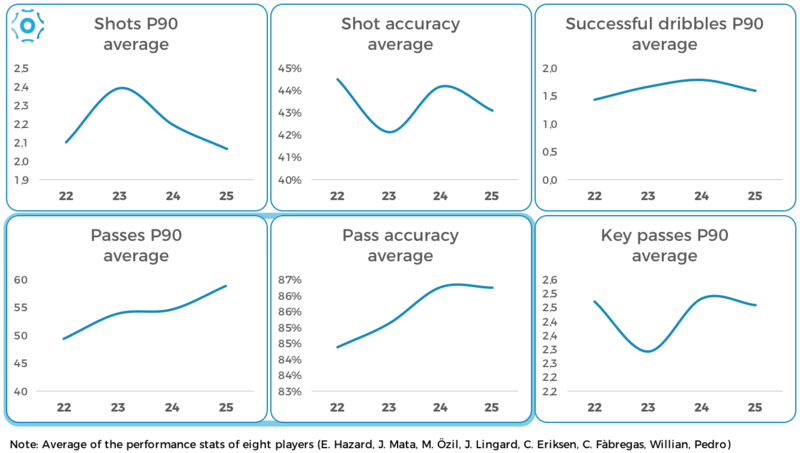 Credit: The dataset for this analysis was sourced from WhoScored.com and understats.com.